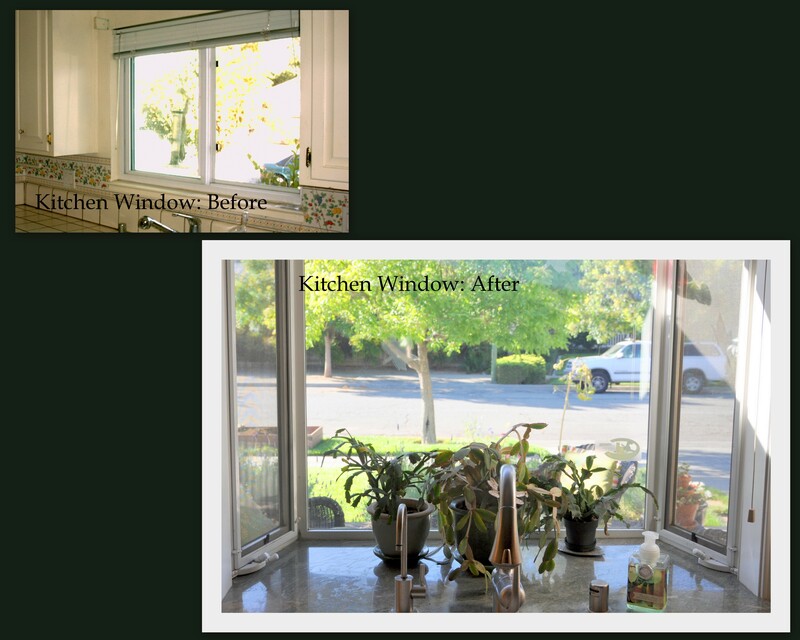 When we remodeled our kitchen over a decade ago, one of the biggest perks was our expanded kitchen window. 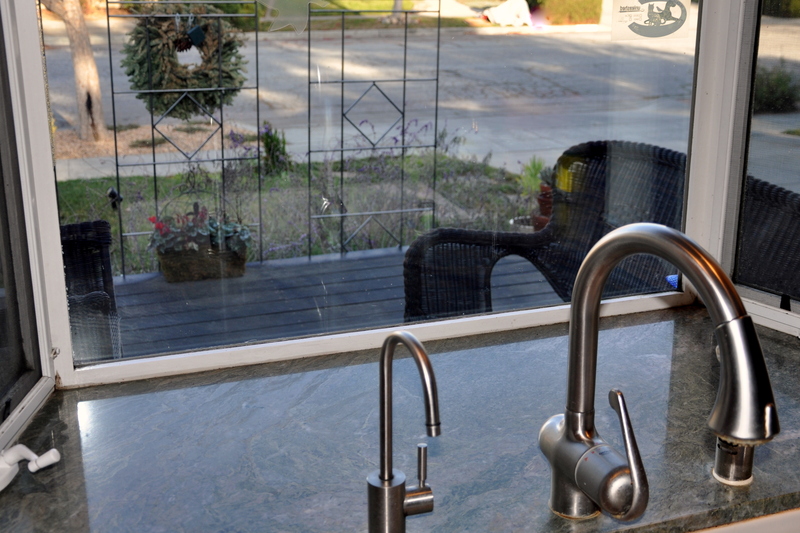 The designer suggested bringing the window down to counter height, then extending it out. I would have all that room to garden indoors. Since then, my kitchen windowsill has gotten a little crowded. 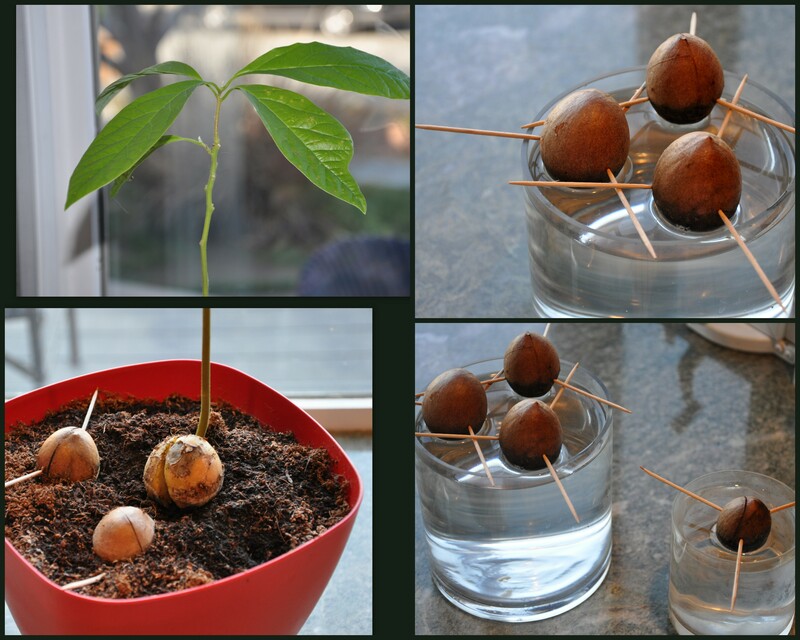 My youngest son started growing avocado pits again, after finally succeeding with this one. It looks leggy but I’m under strict orders not to trim it back, even with my plausible explanation that it will fill out if we do. That’s okay. I live with two teenage boys, so I’m used to being the one that doesn’t know anything. I’m not complaining too loudly. It’s nice to see him show an interest in plants again after a brief hiatus. 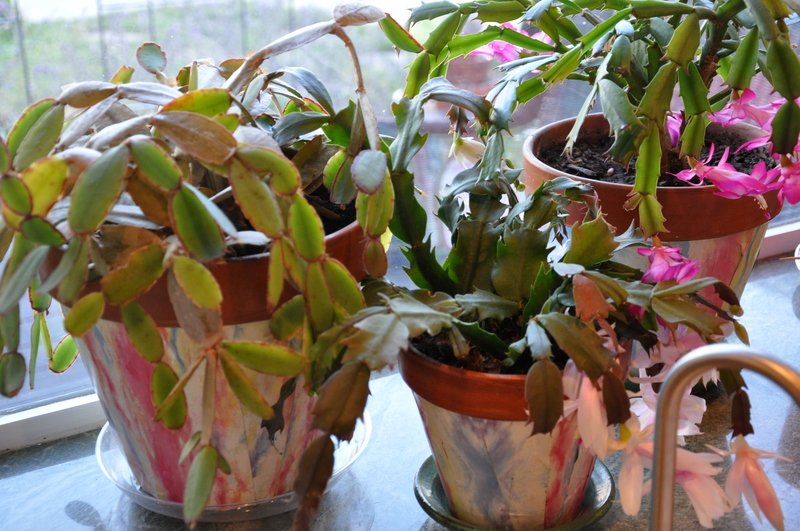 I re-potted three “Christmas Cactus” last year after covering clay pots with up-cycled Petra Paper. The pots held up well. Two of the three plants are flowering now, but the third and largest hasn’t bloomed for a few years. 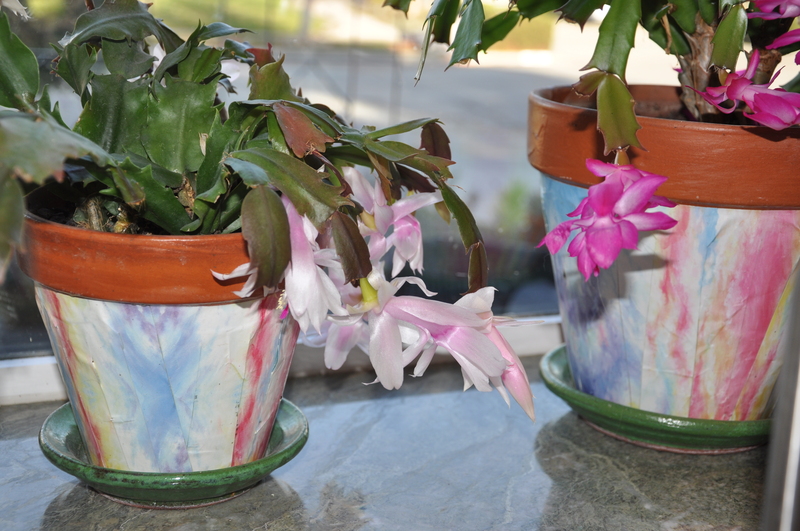 A bit of research revealed this: I actually have two Christmas Cactus and one Easter Cactus. They flower at different times. I love Google! The Easter Cactus is nearly twenty years old, so I wonder if the plant’s flowering days are over? Expecting it to flower in December, however, is pure folly. Hyacinth are one of my favorite flowering bulbs. They’re both beautiful and fragrant and come back year after year. I bought a new variety known as William and Kate this year, and planted three of them indoors. The rest of the bulbs are in a garden pot just outside the back door. I’m also planting some Paper Whites indoors this year. I’ll write more later this week. Here it is again with our indoor garden in place. 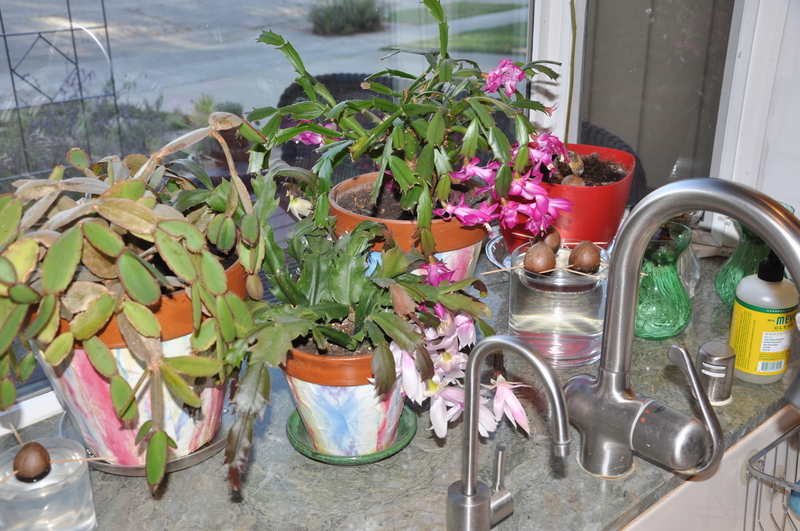 This entry was posted in Gardening and tagged christmas cactus, easter cactus, gardening indoors, growing avocado pits, houseplants, hyacinth bulbs indoors, kitchen window, kitchen window garden, Petra Paper. Bookmark the permalink. I had to go look it up and your Christmas Cactus is unromantically called by it’s botanical name here schlumbergera. I wonder why we kiwis are so prosaic? It also has a common name – which of course I also can’t recall at the moment …. Thanks for looking it up, Pauline. I know it by that botanical name too, but they’re so commonly referred to around here by the layperson’s term. 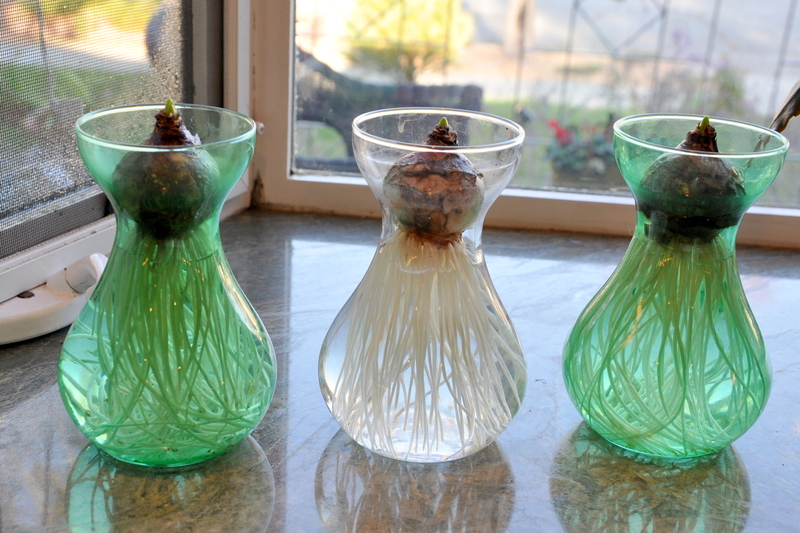 Can you grow them inside and out with your local climate? It would be nice to have more than one of these windows. The added benefit of having it in the kitchen is the non-porous surface and easy access to water, but why not carry that forth into bedrooms, living areas and the like. We can start a trend. I wonder how the lemon’s are able to grow inside without pollination? Do you pollinate yourself? It’s a great idea. Imagine how wonderful the house would smell. Mmmmm. Okay…here we go: Chain Cactus. LOL, I wonder if we can grow Gingkoba? 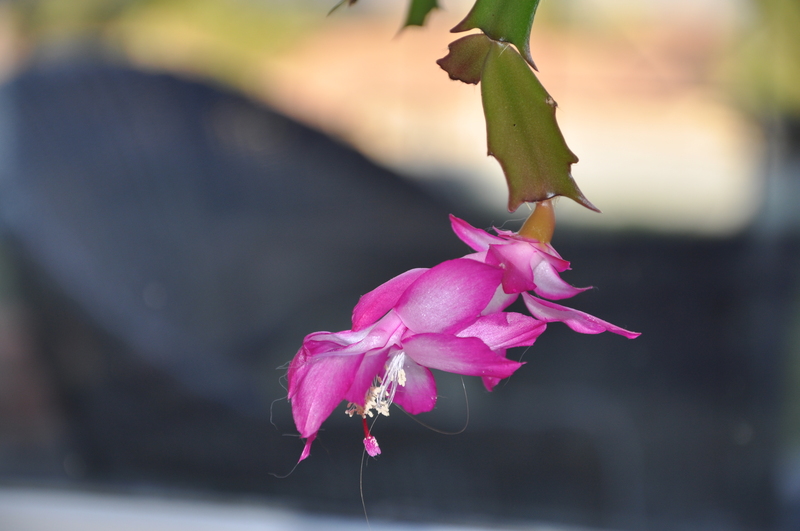 My 20 year old Christmas cactus died in 2014…..I was sad for awhile, but now that we are moving I see that is all part of this bigger plan. I do hope I can relocate my jade plant. It is a transplant from my yard at Fort Ord. …..nearly 25 years old. It is interesting they way we get attached to a plant. I can completely relate to that, ME. My mom had a jade plant for years. It moved a couple of times and survived, so I’m hoping the same will be true for you. I’m quite attached to my plants. I miss growing aloe vera. It’s a wonderful, healing plant to have on hand. Mine never bloomed, but hearing your Momma’s story makes me smile. Good for her. I’m really excited for gardening this year. I would like to re-plan the curb garden and set out a few more perennials and plan sweet peas. I miss them so much. Did you see Pauline’s on her post the other day? Does anything grow in your curb garden in these months? That’s such a good idea to extend the window for extra shelf space for plants…. got me thinking! I also have a Christmas cactus that hasn’t flowered yet… maybe it’s an Easter one after all! Cathy, you’ll have to let me know when Easter rolls around. I actually started gardening indoors as a teenage girl, then moved my way out as place and space permitted. Isn’t that funny? I move plants around until they find the place they’re happy, then try to leave them in position. It’s tricky in the winter with heater’s running not to dry things out, but here, many of the plants that do well indoors like the heat, as long as you balance that with humidity. Most of my plants are in the kitchen or in our living room which has lots of natural, filtered light. My Aunt had a window in her kitchen turned into something similar to yours, and like yours, is full of light and lovely plants. The avocado seeds with toothpicks reminds me so much of my mother! It seems like she was always growing “leggy plants” just like yours. And one more comment from another woman in my family (me) – I have several cactus (cacti?) and I jokingly say that one is Christmas, one Thanksgiving, one halloween. Guess I need to do a bit of research. I assumed the bloom time was related to which window / which direction. I devoted this whole evening to get caught up on blogs. It’s so easy to get behind, isn’t it? But catching up is like a short but sweet visit with friends. I like that: a short, sweet visit with friends. It is indeed. I’m always learning, and find that I challenge my own assumptions about a lot of things when I dig a bit deeper into research for my blog. It keeps it interesting. Even though I’ve had that cacti for 20 years, it was only this week that I realized how different the leaves were and that it was a different type altogether. Does your mom still grow avocado pits? Happy New Year and the extended window looks fabulous – I also also like the look of your paper pots. I have some of the same plant and I call them Zygocactus. I was going to provide you with a link to a photo of mine .. but can’t find the specific post now!! It was fun decorating those pots with the PetraPaper. I would like to do more of those projects, time permitting. I hope this link will take you to the right photo as the flower of my plant looks very similar to yours. I love a garden window and always wanted one. It wouldn’t make any difference here because all the windows are covered by porches. No good light. The window in my kitchen is so high and off kilter I can’t even reach it. I grow almost nothing inside here. One of the drawbacks to this place. 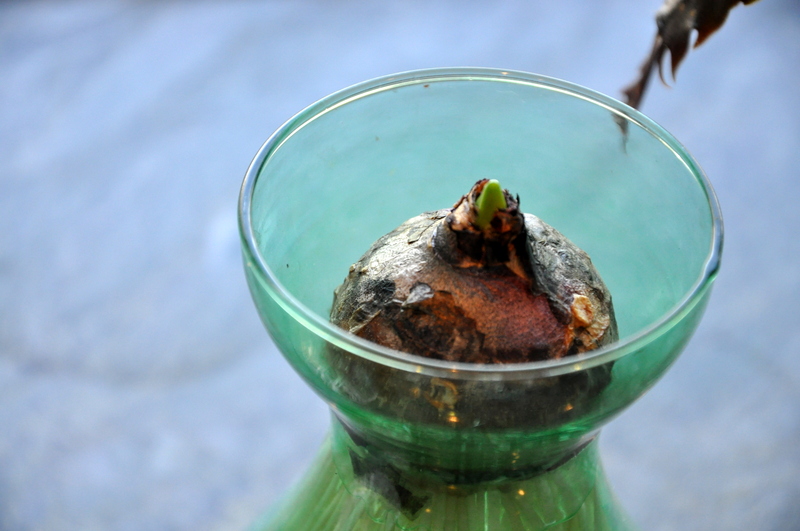 Your plants look so happy and I am surprised by the avocado seed sprouting. It could never be a fruit bearing tree though, could it?